… but I must comment on the fact that less than 2 weeks after my post about Kate Middleton and her prince, she and William are officially engaged — after dating for, what, 7 years?? I highly doubt that the future king of England needed any extra encouragement to finally pop the question — or rather, to go public about it, since apparently he put Diana’s ring on his future bride’s finger while doing charity work in Africa, back in October — but just in case, you’re welcome, Kate. Anyhow, speaking of ending silence, I am back on-line and glad to be posting on my blog again. After a bit of a crummy day a couple of weeks ago, I decided I needed to turn the computer off for a few days and focus my energy elsewhere. I managed to lose 2.2 lbs. in the ensuing 6 days, at least in part because instead of collapsing in front of the computer monitor whenever I got bored or distracted or tired, I found something else to do — that “something else” often as not being housework. I still have a long ways to go to really satisfy myself with how our home looks, but at least some of the lingering messes are gone. The challenge is to maintain what I’ve finished, while continuing to live in the house AND get other areas of the house tackled. What else… well, we had our first appointment with a worker with the local Early Childhood Intervention Program, who will be checking on Sara’s progress development-wise over the next few months. She thought Sara was great fun, and she really is, although sometimes exhausting. She has discovered the wonders of opening drawers, ripping newspapers/magazines, climbing into baskets and between pieces of furniture, and heading off at top speed using a combination crawl/bear walk technique. She nearly catapulted herself off the edge of our bed while playing — fortunately, Bryan grabbed her in time! She is expanding her diet, adding creamed corn and broccoli/cheese/potato casserole (baby food version) to a menu that already includes peaches, pears, green beans, butternut squash and carrots, although she still prefers her bottles (which she will grab at if she is really hungry and we’re not seating her in our laps fast enough for her liking). Stains now decorate numerous items in her wardrobe, as she somehow manages to smear food even underneath her bibs (which she also likes to chew on). I am almost finished my Christmas shopping/gift-making — when you live in a remote area, you shop whenever the opportunity presents itself, whether at a craft sale (like the upcoming Morningstar Faire or the travelling Ten Thousand Villages sale) or in stores in any city we visit. Our first gifts for this Christmas were purchased in July, on a trip to Edmonton. I also have a number of boxes coming in the mail from on-line vendors, and I need to allow for at least 2 weeks shipping time from American stores. We’re starting to get into the Christmas spirit, although I won’t do any wrapping until we have our tree up. I’m hoping to get a real tree again this year, but I’m also hesitant because we’ll have a curious 9-to-10-month-old to contend with. We may end up with a very small tree that’s set at least 3 feet above the ground! But that one could be a real one, if we get one in a pot?! I would like to get a stocking for Sara, and we have an ornament for her already — my mom always gave me and my brother (and more recently my husband) a new ornament every year, generally to symbolize something about the year, and I’d like to do that with Sara as well. I’m dreaming of crackling fires with hot chocolate, the rustle of wrapping paper (I know Sara will be VERY good at ripping it — and we’re thinking of getting a big empty box and wrapping it for her to enjoy playing with, in addition to “real” gifts of course), hot soups and sweet baked goods (butterhorns, cinnamon rolls, a twisted candy cane-shaped bread with fruit inside…), laughter, making my first gingerbread house, finishing up and displaying the Christmas wreath I’m making, uncovering the precious “little angel” ornament I got when I was 3 and hanging it on our tree, the Christmas musical my husband is performing in, candle lighting on Christmas Eve, first photos with Santa Claus…. It will be good. Other good things — I got tickets to see a one-man recitation of “A Christmas Carol” (we went last year and it was superb), “Chuck” continues to be excellent on Monday nights (though that’s rarely when we watch it — thank goodness for DVRs), I got news that I will receive a $1,500 cash settlement as a claimant in a lawsuit by freelance writers whose work was published on-line without their consent, I had a very nice coffee date with my friend Linda, Bryan’s 40th birthday party (with a Mexican theme) was a success, the Saskatchewan Roughriders won the CFL’s western semi final last weekend, my prayer triplet meetings (to pray for fresh vision for our church) are going well, I’m 2 (out of 52) short essay questions away from the end of my doctrinal paper for the missions agency we’re applying to, I finally made it to my massage therapy appointment and my lower back is feeling less sore, I had a nice breakfast date with my friend Timea this morning, tomorrow we’re going to see my parents, and my friend Megan is coming over tonight to watch “The Curious Case of Benjamin Button”, which is one of my favourite movies. 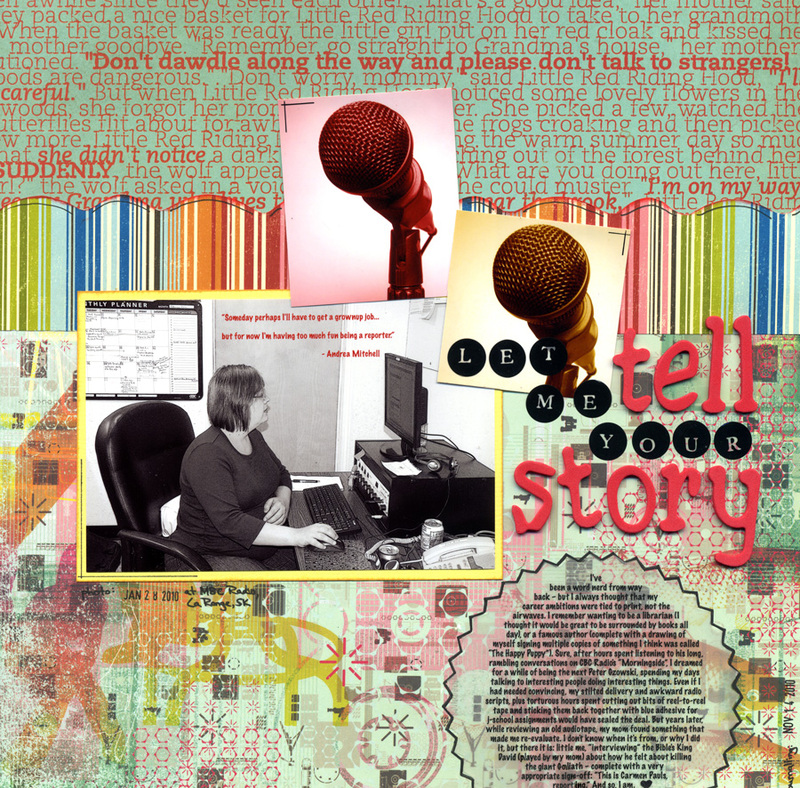 And finally, I finished my second layout for the All About Me challenge blog, wrapping up my stint as their November guest designer. The challenge this time around was to scrap “what I wanted to be when I grew up” — which is the real reason for my post title, Kate Middleton and a homage to the original Star Trek‘s doctor, Leonard “Bones” McCoy notwithstanding. Journalling reads: I’ve been a word nerd from way back – but I always thought that my career ambitions were tied to print, not the airwaves. I remember wanting to be a librarian (I thought it would be great to be surrounded by books all day), or a famous author (complete with a drawing of myself signing multiple copies of something I think was called “The Happy Puppy”). Sure, after hours spent listening to his long, rambling conversations on CBC Radio’s “Morningside”, I dreamed for a while of being the next Peter Gzowski, spending my days talking to interesting people doing interesting things. Even if I needed convincing, my stilted delivery and awkward radio scripts, plus torturous hours spent cutting out bits of reel-to-reel tape and sticking them back together with blue adhesive for j-school assignments would have sealed the deal. But years later, while reviewing an old audiotape, my mom found something that made me re-evaluate. I don’t know when it’s from, or why I did it, but there it is: little me, “interviewing” the Bible’s King David (played by my mom) about how he felt about killing the giant Goliath – complete with a very appropriate sign-off: “This is Carmen Pauls, reporting.” And so, I am.